With easy access and a platform that is Facebook-friendly—but still retaining privacy guards that keep this a Wesleyan-only community—Wesconnect will give you opportunities to check in with friends, make new ones, post photos, and provide updates that keep relationships strong and current. Making its formal debut at Reunion & Commencement, the online community is for and about us—Wesleyan’s alumni. It offers powerful features for you to join or create the groups that will ensure your Wesleyan social or professional network has a vital, ongoing role in your life. “What about Class Notes in the magazine?” you may be wondering. The editors tell us that everyone opens the magazine to those pages first, and the Notes will continue to be a centerpiece of the magazine. What I hope, though, is that we will use the online community to update each other in a more timely fashion than the magazine can offer. Additionally, this richer venue will hold our photos and our full stories. Since there’s no time like the present to log in and see what is going on with your classmates and in your locale, why not try it now? 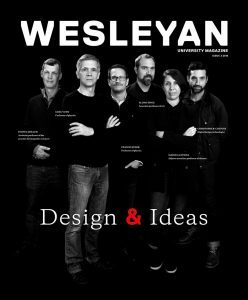 For your first login, you’ll need your Wesleyan ID, which you can find on the back of this magazine. It’s the six-digit number just above your name. After that, you can set up your own user name and password or use your Facebook credentials.